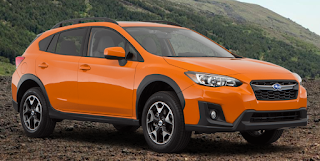 2018 was a full redesign for the Subaru Crosstrek. For 2019, three models are available. The 2.0i, 2.0i Premium, and the 2.0i Limited. All 3 models are powered by a 2.0-liter Boxer four-cylinder engine that that produces 152 hp and 145 lb-ft of torque. There is also a plug-in hybrid model available soon. The base model gets you standard features such as all-wheel drive, a 6.5-inch infotainment screen, remote keyless entry, 60/40-split fold-down rear seat, and a six-speed manual transmission. All trim levels feature Subaru’s full compliment of assistance technologies. They include pre-collision braking and throttle management, lane departure and sway warning, lane keep assist, and adaptive cruise control. On the base model with the CVT, there is a new option package with EyeSight along with a color LCD display for the instrument cluster, overhead console shower light, and tire pressure monitoring system with individual tire pressure display. Premium models feature include a retractable cargo cover, cargo tray, leather-wrapped steering wheel and shifter, heated front seats and exterior mirrors, and dual rear USB ports. The Premium model also receives an updated 6.5-inch multimedia system that now has a single-disc CD player, SiriusXM All Access Radio, SiriusXM Travel Link, and the latest Subaru Safety and Security services. EyeSight is available on a few option packages, bringing along the LCD color display and individual tire pressure displays. The top of the line-up is the Limited model. It comes with X-Mode with Hill Descent Control, an 8-inch infotainment system that adds voice activated controls, Bluetooth hands-free text messaging, 18-inch alloy wheels in black with machine finish, keyless access, push-button start, and six-way power driver seat. Along with EyeSight, the model now comes standard with reverse automatic braking and high beam assist, as well as steering responsive headlights and blind spot detection with lane change assist and rear cross traffic alert. Come check out all the features of this amazing crossover…The Crosstrek, now available at Hanson Motors Subaru. Conveniently located in the Olympia Auto Mall. Come by and schedule a test drive soon.